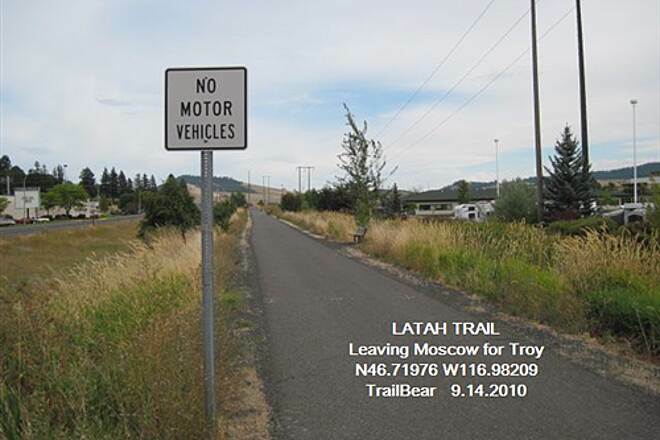 The Latah Trail travels for 12 miles between Moscow and Troy on a 10-foot-wide paved path, paralleling State Route 8 until Howell Road, where it winds north through a forested to Troy's City Park. 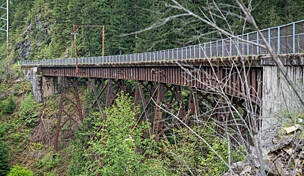 The trail occupies the former right-of-way of the historic Moscow to Arrow railroad. 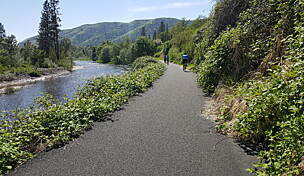 From Troy, the trail carries on another 4 miles on a gravel bed through Bear Creek Canyon. Note, as of autumn 2011 you cannot take the rail bed corridor all the way to Kendrick since part of the route is private property. 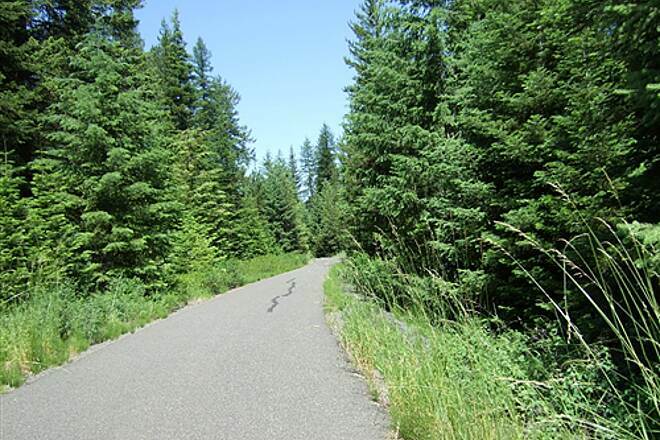 Follow the signs through Bear Creek Canyon, which will clearly designate the portions that are owned by the Latah Trail Foundation (public access) and those that are private property. Please respect private property rights and obey all no-trespassing signs. In Moscow, parking is available just outside the campus where Sweet Avenue intersects with Main Street/I-95. You can also park off Styner Avenue near Indian Hills Drive. Near Cornwall there's a small parking area on the southside of State Route 8. In Troy you can park at the City Park off Route 8. 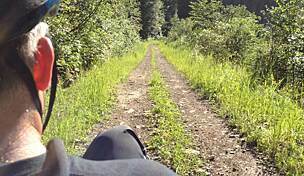 I ride this trail a lot for relaxation and exercise. It travels from the Moscow on the rolling farm land of the Palouse to the forests around the city of Troy 12 miles east of town. Beautiful and peaceful ride. Surface in great condition for road biking. Lot's of small wildlife such as rabbits, quail, chipmunks, squirrels. Saw a badger on the trail one time. 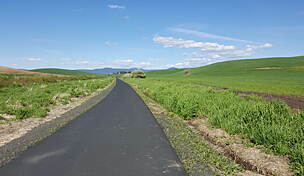 trail gives you a great taste of the scenery and terrain of the Palouse. The Equinox storms arrived a bit ahead of schedule and poor TrailBear got rained off his ride. 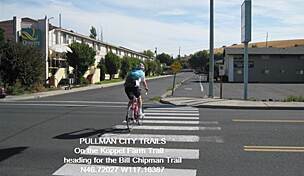 He was OK on the Pullman loop trail around WSU and the Bill Chipman Palouse Trail, but the rains arrived that night and the next day was light rain off and on. It was Fall. What to do? Get in the van and head up the highway to Troy to check out the trail. It runs along it most of the way. Hop out at intervals to get photos. Discover a roadside trailhead not shown on the official map or TrailLink's map. Search for trailheads shown on the topo atlas (one found), go back to Moscow and start tracing the Paradise Path. Get wet, but keep the bike dry. This looks like a good ride. The blacktop at each sample point was in good shape. ***** rating. The scenery is probably a rural ****. 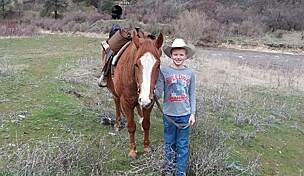 You are riding across the Palouse and through the farms and such. Not many trees. It should be great in the sun. N46.71842 W116.84938. Plug that into Google Earth and you can see it clearly. The ride ends at the city park in Troy, with parking, restroom, water, tot lot and tennis courts. Tennis courts in a little logging town? Loggers are generally not into tennis. A good gun range - now you're talking. However, the park has two courts. 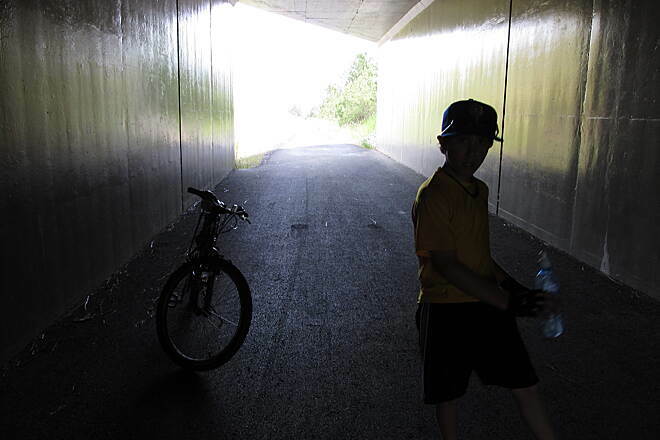 You can ride this as a single out n back or in combination with the Bill Chipman Trail for a longer ride. The two trails are connected in Moscow by the Paradise Path. 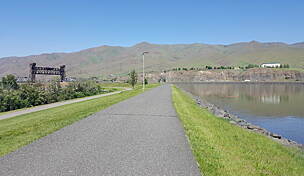 This is a 1.5 mile paved trail that winds through the University of Idaho campus and then up Paradise Creek to merge with the Latah Trail. This fall (2010) a good portion of it is torn up for a goodly bit, but if you can get across campus to College St (W 8th St) and Railroad St., the trail is between the creek and the parking lot. 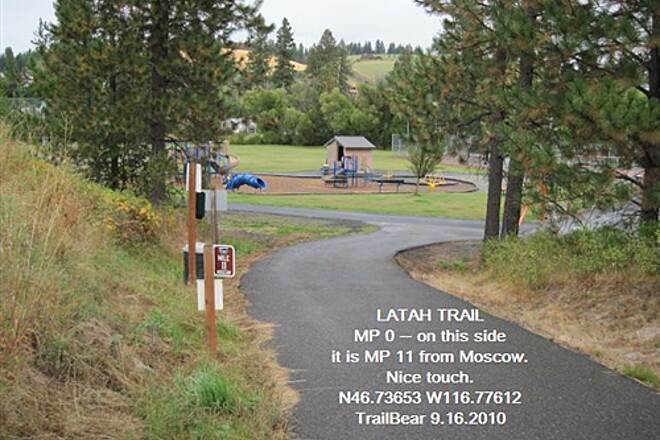 Neither the Bill Chipman or the Latah Trail have formal trailheads in Moscow. For the Chipman, use the mall across the highway. For the Latah, use the mall across the highway. There is a big one at Blaine St x Hwy 8. 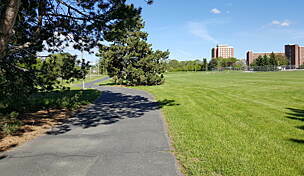 Another option is to use the Berman Creekside Park (Styner Ave. x Hawthorne Dr.). The trail runs across the bottom of the park, along side the creek. Get on the trail and head east. 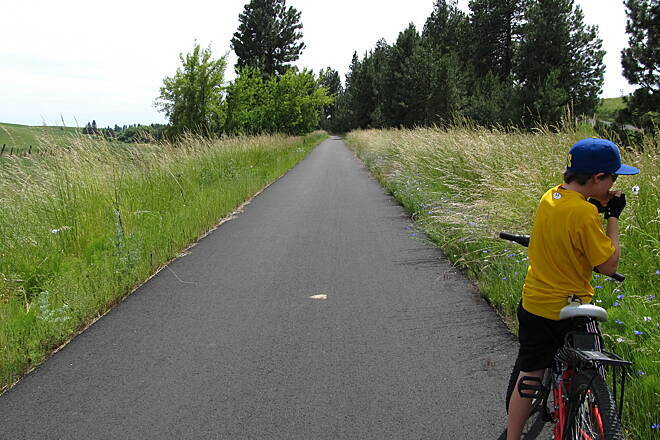 In the Pullman - Moscow area you have a number of trails worth the ride. 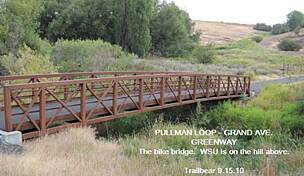 There is an eight mile loop trail around WSU. There is the Bill Chipman Palouse trail - seven miles to Moscow. 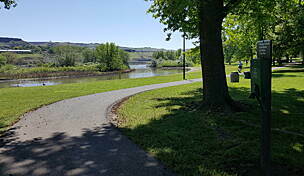 There is the Paradise Path to connect the Chipman to the Latah. 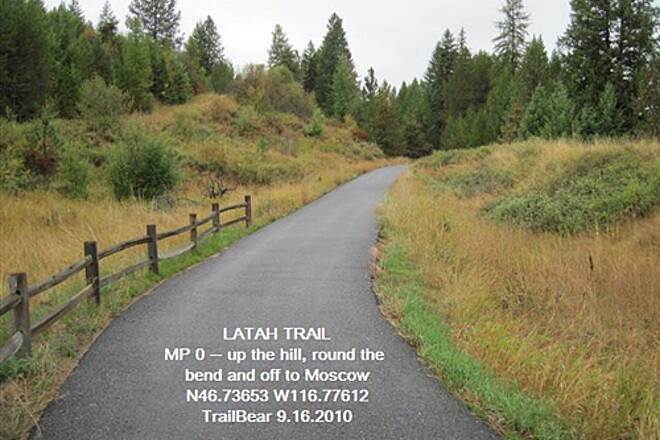 There is the eleven mile Latah Trail. These can be done as one continuous trail, if desired. Drop down from Troy to pick up the five mile between Kendrick and Juliaetta. The Palouse can be a delighful place in the sunshine. Just remember that you are in the midst of a zillion square miles of wheat, a form of grass. Think: Allergies. 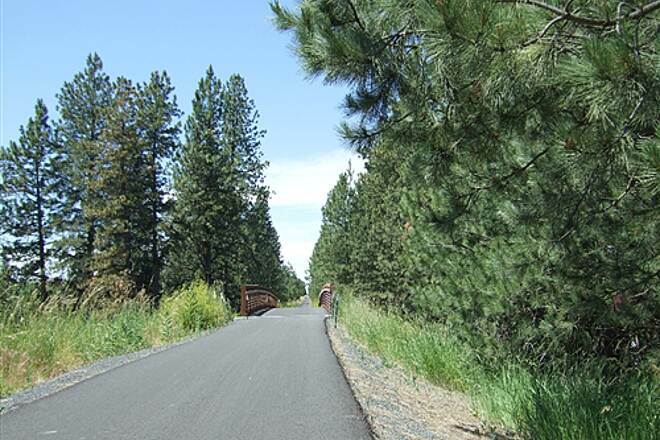 The Latah Trail paving and bridge at Wallen Road are finished! 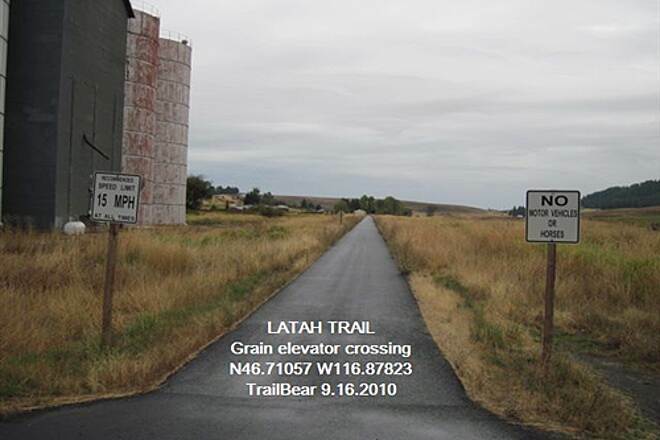 Kudos to the Latah Trail Foundation and all of the volunteers who've made this great trail between Moscow and Troy, Idaho a dream come true. 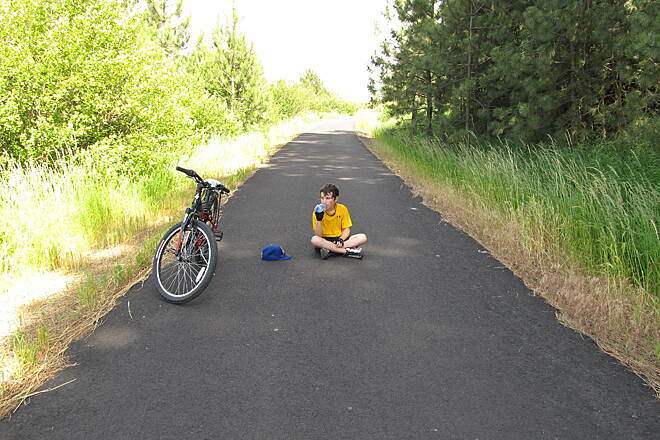 I was able to ride home on the trail for the first time on 1 October, but they were still paving at Howell Road at 6 PM. It was quite memorable when I walked my bike by the paving machine and crew and the boss asked if the 280 degree pavement had melted my tires! I could feel the heat from the trail still. I did get some sticky tar on my tires, and now it is as if they’re studded for winter! I certainly jumped the gun a bit for this ride. 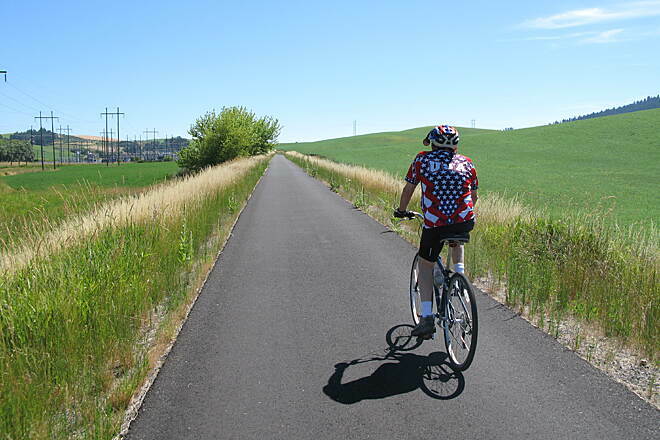 Trail signage and other amenities are still to be done but this trail is a great ride now through beautiful rolling hills of the Palouse. I think 2009 will see many users on this trail! This morning on the way into Moscow from Troy at 7:30 we saw a Westway truck near Wallen Road. Hopefully this means they are going to start on the final paving and the bridge this week! We may have enough good weather left to enjoy this trail before the snow starts. 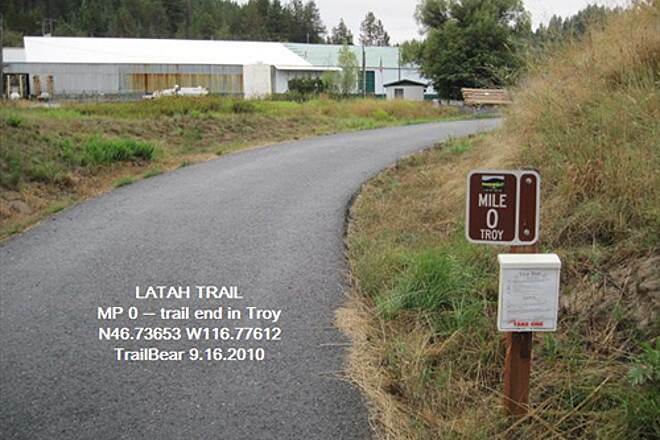 So, last Wednesday I go for a walk on the Latah Trail in Troy on my way home from work. I walk one mile, turn around, walk another mile. No problem. Snow is all gone! A great walk on a great trail. 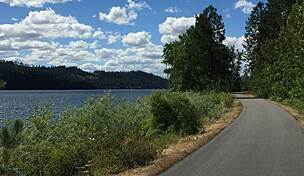 Then, yesterday I take my newly tuned bike for its first ride in weeks intending on riding all the way to the end of the pavement on the Latah Trail, two miles from Troy. Went for about a mile and a quarter and there it was. Snow. Almost 100 yards of it, 4-6 inches deep. So, I walked my bike through the snow, then lifted it over a medium-sized tree across the trail and was able to ride to the end. Sheesh doesn’t even come close. It is May already for goodness sake! I guess here in Northern Idaho you have to carry a small shovel with you when you ride in the Spring! The Troy Trail was fine though, clear all the way, so I had to be happy about that. 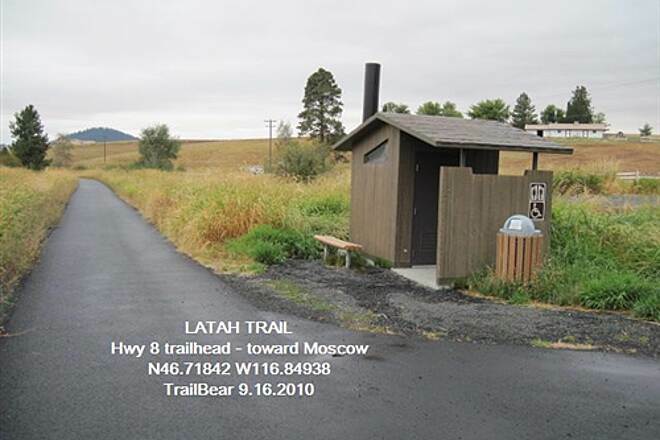 Can't wait for the rest of the Latah Trail to be paved so that I can ride home from work in Moscow as often as possible. It should give many people a good boost - both in fitness and energy conservation.